The #1 reseller of JETCAM products in the Americas for the last 14+ years. In 2014 NestOne was awarded 'Best Dealer' worldwide during JETCAM's worldwide reseller conference held in London, due to consistently high sales levels over the years and high quality of customer support and satisfaction. We are the ONLY reseller that sells JETCAM exclusively and is 100% staffed for JETCAM sales and support in North America. Our clients' JETCAM systems are the most advanced in the world and often completely automated and integrated with critical software systems such as CAD and ERP. Our composite solutions deliver multi-faceted optimization of materials through advanced nesting and real-time tracking technologies. Our sheet metal solutions deliver advanced material optimization and reduction in inventory. Your bottom-line is how we measure success! CrossTrack provides real-time tracking from receipt of rolls through the auto-clave, all freezer in/out time, and optimizes use of materials to prevent expired materials. When combined with JETCAM's High-Performance Nester, it delivers the highest material savings possible to companies fabricating parts from composite materials. The CrossTrack MTL and CrossTrack (Nesting-agnostic) Solutions provide composite material tracking for clients who need material tracking without integrated nesting software. CrossTrack provides a robust architecture built on Microsoft SQL Server, and provides Windows, Android, and iOS client apps depending upon function. CrossTrack is compatible with bar-code and RFID scanners, and other IoT devices to aid in automated tracking. Click this link to read about success at Connova AG using CrossTrack. JETCAM Expert software can be combined with our partner The Aquila Group's "Dynamic Machine Management". (Real-Time Dynamic Nesting Integrated with ERP). DMM is an (MES) system that enables companies to implement Demand Pull, Lean Manufacturing Concepts, & “Design to Production” (D to P) strategies. In short, DMM provides optimal orders scheduling across all work centers to produce parts on-time at the lowest cost. The Dynamic Nesting feature enables the operator to generate machine code and setup instructions for nested programs in a matter of seconds, based upon the very latest demand requirements. DMM integrates in real-time to all ERP systems and delivers optimization when combined with JETCAM HPN that is unparalleled. BMP Metals, Inc, featured in Canadian METALWORKING and Canadian Fabricating & Welding publication! 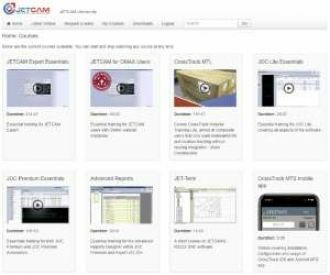 All JETCAM users can get 24/7 free access to online video tutorials. Login or request access now.